SHOWER-TROL - The name synonymous with water conservation is in its second generation of metering use. 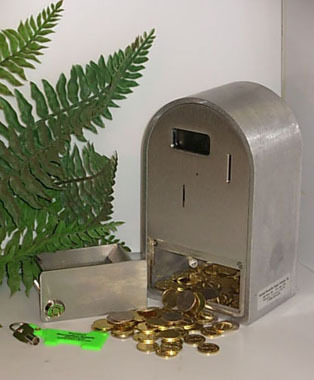 The electronic coin meter controls the delivery of water for a time specified by you. Whether in the desert Southwest or Northern New England this metering system is economical to own and operate and will conserve energy and water with every hot shower taken. Shower-trol savings go beyond conservation - the controlled delivery means lower sewerage and disposal, reduced processing requirements and less strain on your budget. The meter in our Shower-trol packages is COIN-TROL - used to control time and use of nearly any equipment you want as "Pay for Use". Court lighting applications at schools, homeowner associations, public parks and private clubs from Maryland to California are benefiting from the rewards of timed lighting. Customers report reduced expenses, self sustaining courts and fewer complaints from neighboring residents when lights are controlled. Other known uses already in service are washers/dryers, batting cages and riding arena heat lamps, battery chargers even boat trolleys by a Canadian guide service. Whatever your metering need, you've found the right meter with Trumbull. DUMP STATION EQUIPMENT - Trumbull is the leader in the design and production of sanitary dump station equipment. The combination of research, regulations and customer suggestions have yielded a line of products for both drive through and at site dumping facilities. 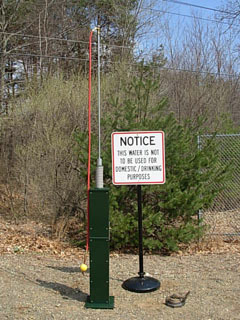 Our water towers are suitable for year round use in conditions found from Alaska to Florida, Canada and the Caribbean. Our hatch covers and site sewer caps are engineered to withstand environmental and human punishment and give years of durable, maintenance free service. Our complete line of signs gives you a choice in how you will notify users of location, warnings and instruction. Whether you are upgrading, building new, or complying with an insurance requirement invest in your future with Trumbull's equipment. You'll be in good company with the National Park Service, USACE, BLM, state DEP's, and county governments nationwide. EURO-SHOWER - Designed to conserve water, Euro-shower makes a positive statement about your facility and you when installed as an amenity for your guests. In areas requiring rinses before pool use, Euro-shower can be easily installed and meets all requirements. Sleek and attractive and intended for public use, Euro-shower looks beautiful on boardwalks, outside bath houses, pool decks, or any private beach. ADA compliant. Economical to purchase, easily installed and practically maintenance free. Euro-shower is so practical the US Army Corp of Engineers specifies it. PET PATROL - As the number of dogs increased in this United States, so did the need for controlled environments and sanitation. Dog parks were born and immediately the need to have pet owners act responsibly was evident. 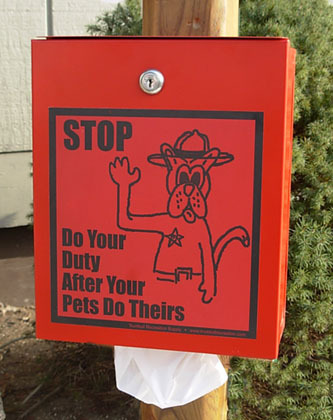 Pet Patrol accomplishes everything but the actual pick up of dog waste. Eye catching red can be seen from a distance at your dog park, public parks and pathways, beaches, athletic fields, even university settings. Our Deputy Dog acts as a playful sentinel to remind owners "Do your duty after your pets to theirs" - the Pet Patrol motto.